Perched in the south–west of Idukki district, Munnar in Kerala is a quaint little hill station at about 1600m above sea level in the Western Ghat mountain range. Today, Munnar sightseeing is a must have on the itinerary of any tourist to Kerala. The name of this town was derived from its location at the confluence of three rivers Mudhirapuzha, Nallathanni and Kundali. The lush greenery and tea gardens make Munnar a heavenly adobe. But, the beautiful waterfalls spread across this town, are must see Munnar tourist places. 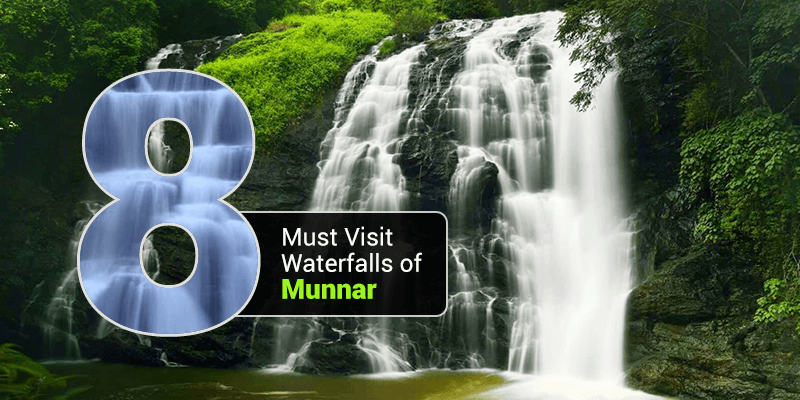 So, we bring before you a list of the 8 best waterfalls to add in your list of places to visit in Munnar. Onward Journey: You can book a cab for your forward journey. 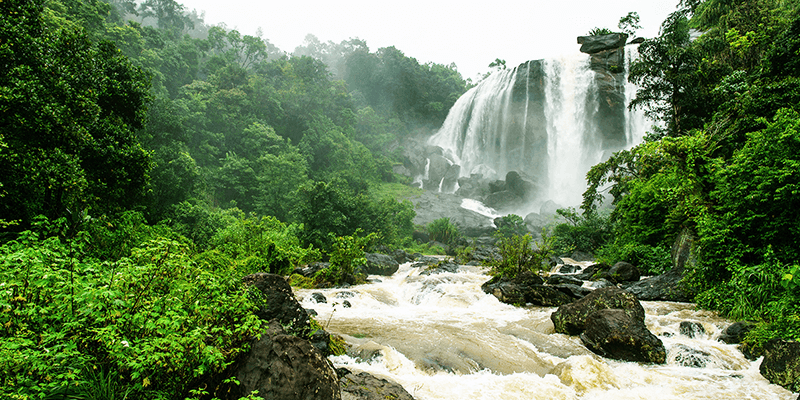 You will drive along the NH-49 and would be amazed by views of beautiful forests and scenic waterfalls along the route. The section between Kothamangalam and Adimali is especially beautiful, as you can experience the sweet scent of tea leaves from the plantations. 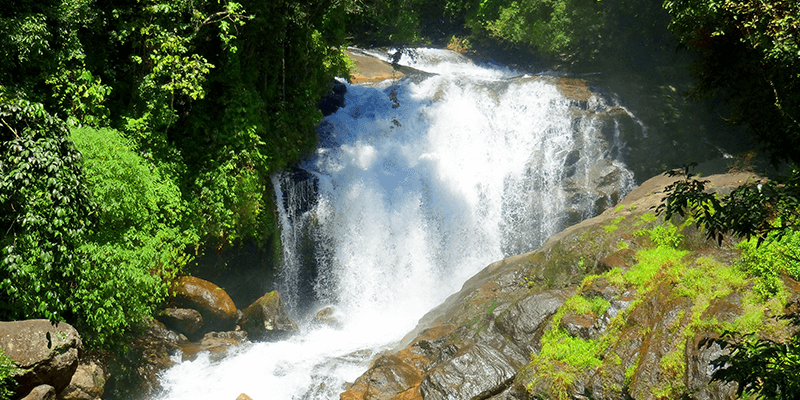 Attukal Waterfalls lies 9 KM away from Munnar towards the town of Pallivasal. The view of the surrounding hills and the roaring water falling from the mountain top, etches indelible memories in your mind. Trekking around the waterfall slopes is another source of interest for the adventurous minded visitors. Beware: This waterfall is not meant for bathing, it has dangerous under-currents. Tip: You might want to take a sip of tea from the roadside stalls. They would cater a fragrant cup of fresh tea. Situated on the route from Munnar to Marayoor (5 minutes drive from Munnar town), this waterfall is surrounded by “Vaga” trees, which wear beautiful red flowers. 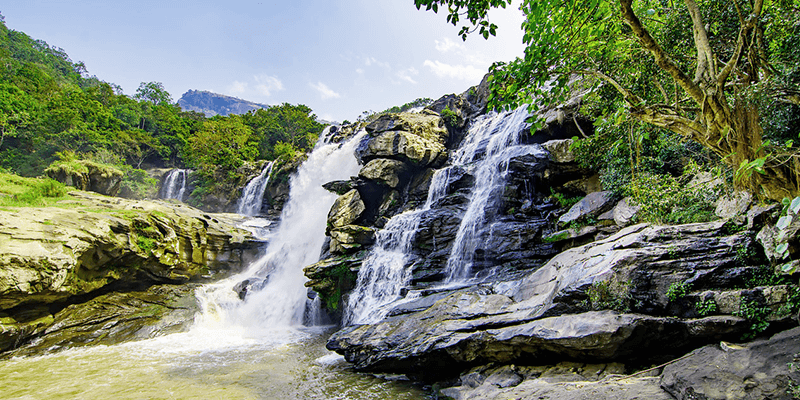 Originating from the Eravikulam Plateau, creating a multitude of mostly inaccessible cascades, this waterfall offers the most visually captivating sight among Munnar waterfalls and attracts a steady stream of visitors. Tip: The adventurous minded travellers can look forward to taking a bath in the icy cold water. Originating from the divine river Devikulam (which is believed to have been sanctified when Sita took a holy dip in it). This scenic waterfall, surrounded by beautiful green forests atop mountain ranges, is also called the “Power House”. The waterfall is just 15 KM away from Munnar. 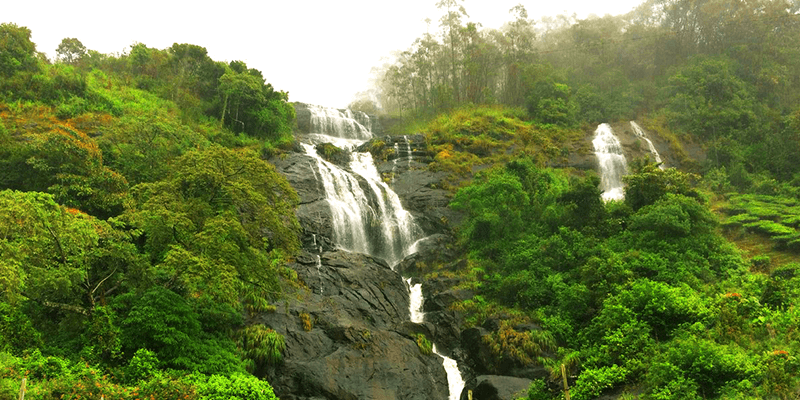 The lush greenery and tea plantations all around give Chinnakanal Waterfalls its unique charm. Beware: This waterfall is only meant for viewing from far, the road to the waterfall is very dangerous. Tip: While visiting the waterfall, try tasting the fresh cut fruits from the roadside stalls. This spectacular waterfall falls enroute Rajamala (10 KM away from Munnar). The water gushing down from a 1600m height nourishes the green forests surrounding the waterfall. It is a well known trekking and picnic spot. Ideal time to visit Nyayamakad is soon after the monsoon. Tip: A road trip to this waterfall will take you past some scenic tea gardens, where you can stop the car and watch the local women picking tea leaves. During your visit to Munnar, do not forget to spend some quality time with your family at this beautiful picnic spot. Kuthumkal lies 24 KM away from Munnar. The specialty of this waterfall: it is covered by a sort of mist caused by high speed water falling from a great height and hitting the rocks underneath. 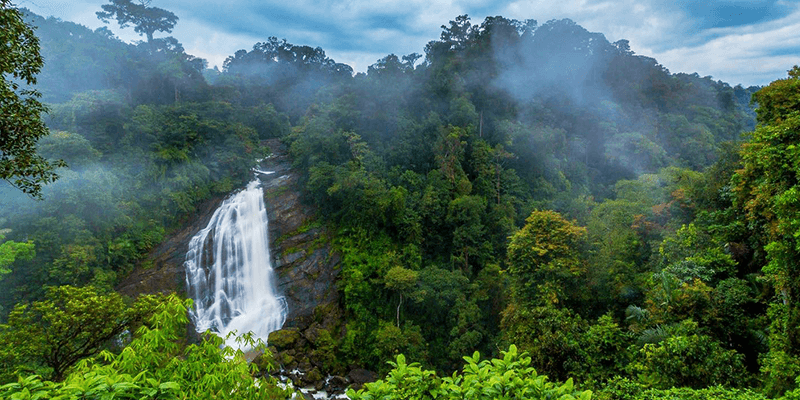 Originating from the River Pambar and located deep inside the Chinnar Wildlife Sanctuary, 60 KM away from Munnar town, only a guided trek through the mountainous forests will take you to this beautiful waterfall. The trekking experience, commencing from the check post of the Alampatty Forest Area, will take about one hour and would be filled with sightings of the wild flora and fauna enroute. Tip 1: Contact the Forest Department if you want to camp within the forest for one night. There are beautiful log houses available for the purpose. Tip 2: Elephant sightings are common along the trekking route. 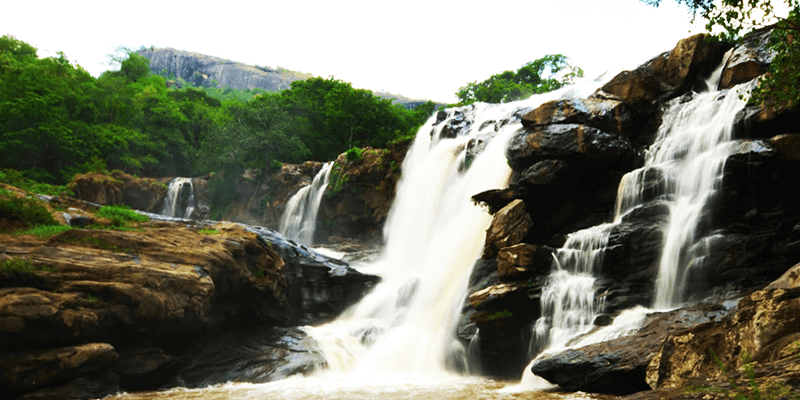 Situated 40 KM away from Munnar, on the Kochi-Madurai Highway, between Adimali and Neriamangalam, Cheeyappara is a 7 step cascading waterfall. Lying about 1000 ft. above sea level, it is easily accessible from the nearby towns, and also provides ample opportunities for safe and adventurous trekking. 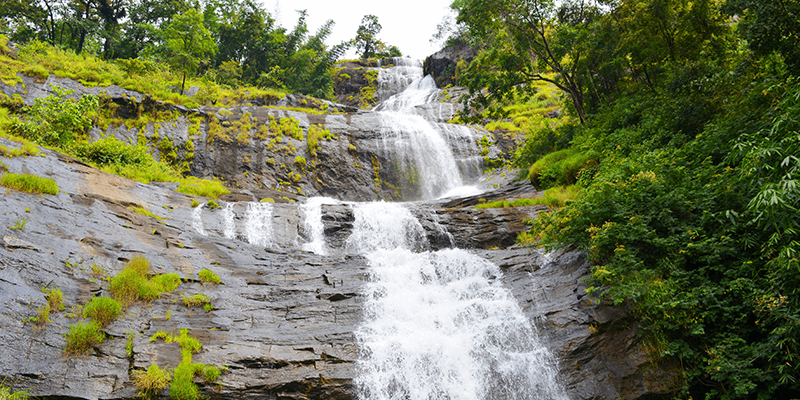 Tip: Cheeyappara waterfall is an important halt along the long drive from Munnar to Kochi. Travellers enjoy the fresh breeze and food from the snacks stalls in the viccinity. Located between Adimali and Neriamangalam, it is located 42 KM away from Munnar. 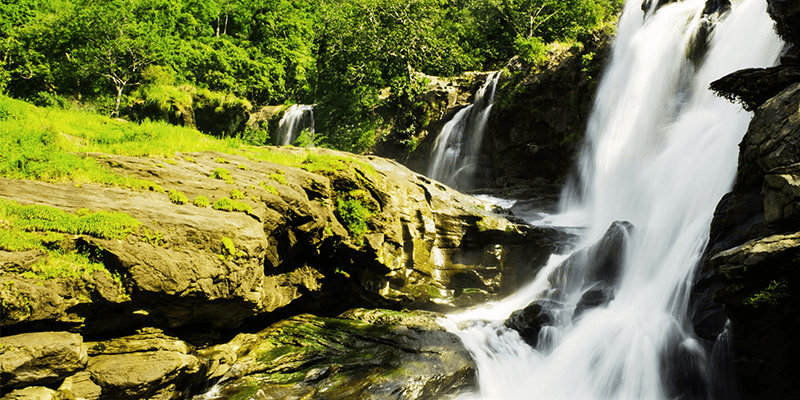 The Valara waterfalls, is close to Kerala Electricity Board’s – Thottiyar Hydroelectric Project. This waterfall forms a chain of several waterfalls amidst lovely and picturesque green forests. The cascades, falling from heights of about 1000m, are an exhilarating sight in itself. Trivia: The lush green forests nearby are home to some rare species of plants. Previous articleTrilokinath Temple: Where Religions Merge into One! wow, very good blog. These include a lot of information relating to Munnar.